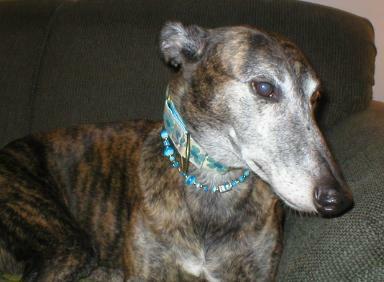 to help.In June, 2005 one of my favourite greyhounds, Clover, was diagnosed with osteosarcoma. By July, she was gone. I had to do something to help! created an Awareness Collar Bling for Hope, something all dogs and their humans could wear. My intent was to raise a couple of thousand dollars. How little I understood the greyhound owner. for Hounds began in November 2005. She captivated our hearts and took a piece of it with her. She brought people together to fight a common cause and we will continue that fight in her honour. continue the difficult work to conquer cancer in greyhounds. wonderful years with no return of the tumor.